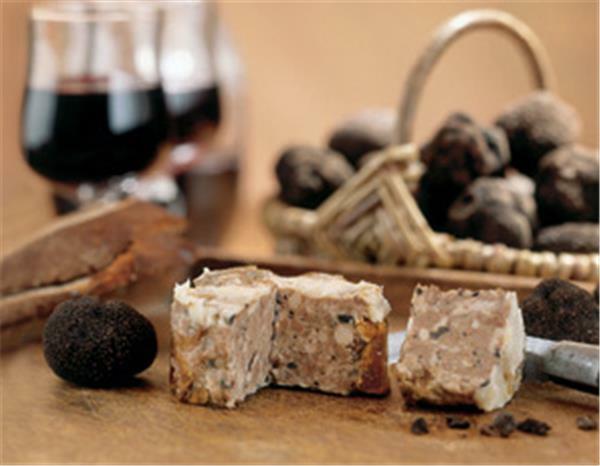 This terrine is flavoured with the Tuber Melanosporum Winter truffle, the so called Perigord truffle that has a dark flesh and white veins. Her fragrance is entrancing and her very powerful flavour is very pleasant. 100% natural and preservative free – the colour, flavour, taste, smell and texture are really supreme and a real treat! Delicious served on some lightly toasted rustic bread. Storage: Can be stored in a cupboard up to 3 years. Once open store in a fridge and consume within 2 days. Pork meat, pork liver (20%), black winter truffle tuber melanosporum 3%, milk, salt, Armagnac, spices, sugar.